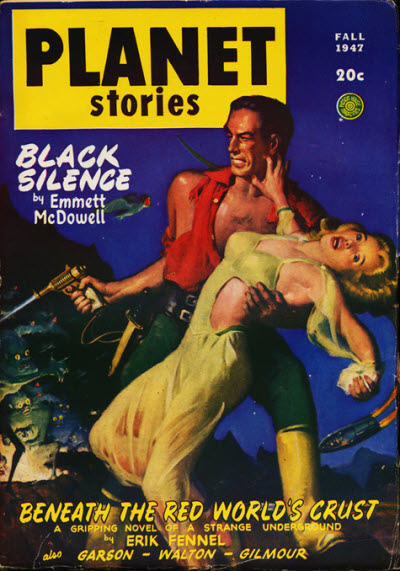 First appearance: Planet Stories, Fall 1947. "Dan Kearns, sick and shaking, could already hear them talk: 'Yeah, come in on the Kearns beam—it's a new way to die!'" The doctor shook his head. "Some sort of convulsion. Muscles violently con-tracted. Funny he didn't fall to the floor. Must have affected the whole nervous system. Even the eye pupils are down to pin points." He looked around at Rawlins. "I may be sticking my neck out, sir, but off hand I'd say Stevens was killed." "Killed?" Rawlins blinked at the form in the chair. "But that's impossible. The door was locked. The room hasn't been disturbed and there aren't any holes in the glass. Nothing could get in here except light." - A current safety concern (see HERE) just happens to relate to our story. - We tried, honest we did, but we couldn't find any biographical information about our author. The bottom line: "The best car safety device is a rear-view mirror with a cop in it."